The wheels of justice grind slowly, even when they pertain to the ones on a bicycle. Last month, a federal court upheld a $7.3 million verdict previously granted to James Nelson and his wife, Elizabeth Varney, as a result of terrible injuries he suffered by crashing into a sinkhole on a United States Air Force Academy bike path during the late summer of 2008. For Nelson and Varney, the shadow of increasingly complex litigation has hung over them for more than ten years since this life-altering incident. And while Burg Simpson attorney David Hersh thinks it's doubtful the feds will appeal a case formally known in the 2014 document, linked here, as James Nelson and Elizabeth Varney v. United States of America, the possibility remains. Jeff Dorschner, spokesman for the U.S. Attorney's Office in Colorado, which defended the case brought by the couple, says only that "We are reviewing the decision." An appeal to the U.S. Supreme Court can be filed through the end of March. This decade-plus battle started in a very commonplace way. "On September 3, 2008, Jim went for a bicycle ride from his home in Colorado Springs," Hersh recounts, "riding on a designated bike path that happens to be on U.S. Air Force Academy property on the east side of I-25." Hersh acknowledges that the path isn't on the official AFA trail guide, "but we had testimony that's it's used by a lot of students, including high school students, and the general public for hiking and walking and biking. There's perimeter fencing within the Academy, but there's an engineered opening there, and it's clear that it's there to accommodate the bike path. And there was even a sign that said 'No motorized vehicles.'" 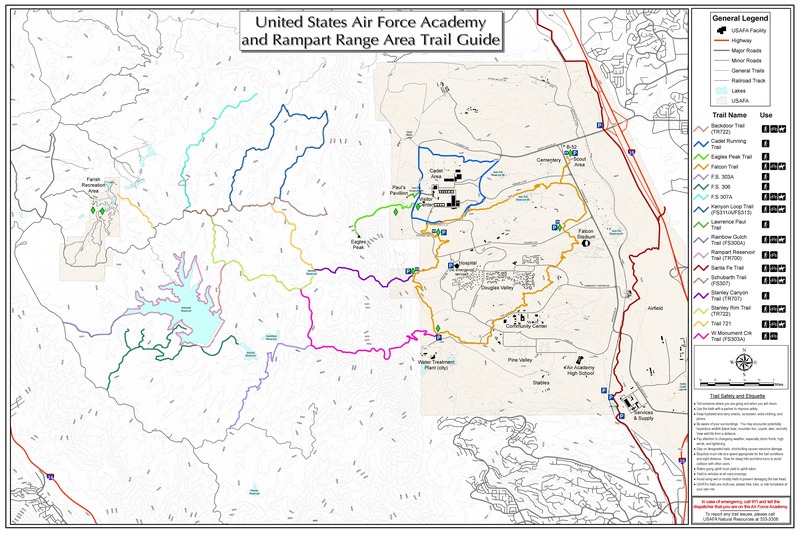 A map showing trails at the United States Air Force Academy. A creek ran underneath the route at the bottom of a hill, and because trees and shrubbery cast a shadow across it, Nelson couldn't see that "at the very bottom of the dip, there'd been a washout that had overwhelmed a relatively small culvert and wiped out the path," Hersh continues. "There was a gap completely transecting the bike path. It was probably four to five feet on the other side of the washout and about seven feet deep. And because of the shadows, Jim rode right into it." Nelson doesn't know exactly what happened next; his memory of the crash is gone. But based on his reconstruction of the event, Hersh believes that "Jim did a face plant and suffered severe brain and multi-system injuries. He was knocked cold and was comatose throughout the night, and when he didn't return home, his wife panicked and called for help." That Nelson didn't die was thanks to another user of the path. According to Hersh, "An anchor for one of the local TV news stations was jogging, saw Jim and reported it to search-and-rescue people, who saved his life." Because the path wasn't on its property records, the Academy initially took the position that Nelson was a trespasser. But in 2014, Senior U.S. District Judge Wiley Y. Daniel found otherwise, based in part on evidence that the AFA had long known of the path's existence and took no steps to remove it, even after the Colorado Department of Transportation offered to do so. Moreover, Dr. Brian Mihlbachler, a biologist for the U.S. Fish and Wildlife Service who was stationed at the Academy as the natural-resources manager, took photos of the sinkhole on August 20 as part of his efforts to document "erosion problems caused by storm water draining onto the property from residential neighborhoods east of the property," Daniels's ruling states — but he didn't show the image to anyone prior to Nelson's crash. As a result, Hersh argues, "the Air Force Academy had not only general knowledge about the path and problems with it and people using it, but they had specific knowledge that a dangerous condition existed for two weeks and left it. And the very next day after Jim was hurt, the Academy blocked both ends of the path, took the signs down and put barricades around the washout — and within a week, they'd filled it in with construction material." James Nelson with attorney David Hersh, left, and paralegal Autumn Goes, right, after the verdict. The government subsequently appealed Daniels's verdict, from which the $7.3 million judgment flowed, to the 10th Circuit Court of Appeals — and this time, its argument was based on the Colorado Recreational Use Statute, which, as Hersh explains, "offers immunity to land owners who permit individuals to use their property for recreational purposes without charge." In 2016, the 10th Circuit's panel of judges, including Neil Gorsuch, who is now on the U.S. Supreme Court, determined that the statute definitely applied. But they didn't come to a conclusion about an exception to the law for "willful or malicious failure to guard or warn against a known dangerous condition, use, structure or activity likely to cause harm," since Judge Daniels hadn't considered it. So the case went back to Daniels, and after a hearing in June 2017, he decided that the exception had been triggered. That prompted another government appeal to the 10th Circuit, which found in the February 12 ruling linked here that "the Academy has failed to provide a justifiable excuse for its willful failure to guard or warn against the likely harm posed by the sinkhole." This determination reactivated the $7.3 million verdict and gave the government 45 days to file a motion for rehearing. But while Hersh concedes that "my crystal ball isn't perfect, by any stretch," he doesn't believe there are any major constitutional issues that would make it a strong candidate for acceptance by the U.S. Supreme Court — and that's apart from any questions about whether Gorsuch would have to recuse himself, since he heard an earlier version of the case. In the meantime, Hersh says Nelson and Varney are pleased by the latest legal turn — but it's tough to consider it an unabashedly happy ending. "Jim was an engineer and very accomplished as a property manager, with probably a higher IQ than I could ever dream of having. He was a very capable provider, and this has just been devastating for them," he explains. "So he and Elizabeth are grateful that they're finally going to be able to get some medical care that he still needs and pay off some debts, get a car they can count on and avoid losing their house. I'm grateful for them about that. But this has been going on for almost eleven years at the Nelson household, and it's been a tragedy for them."